Founded by Walter Bitner, Tracy Silverman, and ten students in June 2007, MCYO now serves students in both middle school and high school with a string orchestra and a growing chamber music program. 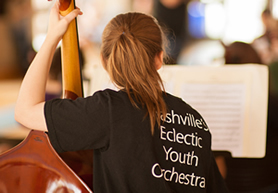 MCYO's musicians represent a broad array of backgrounds from across the metropolitan Nashville area; our current enrollment includes students grades 6–12 from twenty different public and private schools as well as students from homeschooling families. Our students include some of the most talented and accomplished young string musicians in Tennessee. Many have won honors for their musicianship including acceptance to and leadership at Tennessee Mid-State and All-State Orchestras, String Crossings at Belmont University, and the Tennessee Governor's School for the Arts. Hallmarks of our program include a high-energy, joyful atmosphere for music-making and an eclectic approach to programming that includes classical masterworks, jazz and rock standards, and traditional music from around the world. Since inception, MCYO performed concerts at The Belcourt Theatre, Belmont University, Lipscomb University, Schermerhorn Symphony Center, The Tennessee Performing Arts Center, The Renaissance Center in Dickson, Tennessee, The Nashville Shakespeare Festival, and Centennial Park. The orchestra also had the rare opportunity to record at the prestigious Ocean Way Studios on Nashville's Music Row. Our 2018-2019 season continues to feature performances throughout Nashville. For upcoming concerts and events please visit the Calendar page of this website. We believe that music-making should be a joyful activity, both in rehearsal and performance. We employ a disciplined approach and strive for high standards of accomplishment while at the same time relaxing some of the more formal attitudes commonly associated with the orchestra. We aspire to create a collaborative effort where the students take ownership and contribute to the work of the group beyond simply learning their parts. The collective contributions of the members of the group determine the identity of the organization. We also make use of the invaluable resources that we have here in “Music City” through an eclectic approach to programming that explores a diversity of musical styles, and by seeking opportunities for the orchestra to collaborate with world-class professional musicians. Discipline and a rigorous approach to learning are most successful in an environment that also embraces enthusiasm, fun, and whimsy. Exploration of a diverse repertoire including a broad spectrum of western art music as well as traditional and popular styles is the most relevant approach for student musicians in the 21st century. Information on how to support MCYO can be found on the Donate page of this website.